The new Encampment River bridge built in 2010 was pushed downstream by an ice dam this past weekend. This is on the Superior Hiking Trail in a section not far north of Two Harbors. This is an extremely difficult place for a bridge as one bank of the river is high, and one is low. The past bridges descended a long cleated ramp to reach the bridge decking which was about 5 feet above summer water level. However, a continual problem along the North Shore (of Lake Superior) is that in the spring water is high, filled with ice floes, and the valleys are narrow. Bridges are often damaged or swept away. Many of the smaller bridges have been cabled to trees on one bank so that if they are broken loose in the spring the bridge may be turned sideways, but may be salvaged for re-placement. Encampment River, however, is a major bridge. It is not known at this time if the bridge can be salvaged. It's a shame, since it was finally replaced last year, after many seasons of being in a damaged and dangerous state. One has to wonder if it might be worth the expense to build a high bridge from the upper bank, with stairs descending to the lower bank. 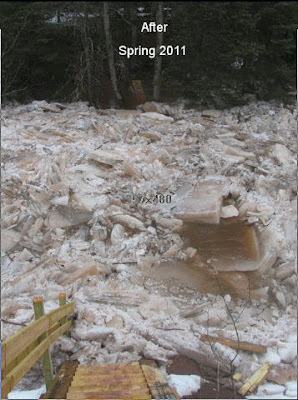 The ice could still attack the footings, but it wouldn't present the whole stringer/decking system to the pressure of jammed ice being carried downstream.